Personal computers may soon save large amounts of energy by "sleep talking." Computer scientists at UC San Diego and Microsoft Research have created a plug-and-play hardware prototype for personal computers that induces a new energy saving state known as "sleep talking." Normally PCs can be in either awake mode—where they consume power even if they are not being used, or in a low power sleep mode—where they save substantial power but are essentially inactive and unresponsive to network traffic. The new sleep talking state provides much of the energy savings of sleep mode and some of the network-and-Internet-connected convenience of awake mode. UC San Diego computer science Ph.D. student Yuvraj Agarwal presented this work on April 23, 2009 at the USENIX Symposium on Networked Systems Design and Implementation (NSDI 2009). Computer scientists at UC San Diego and Microsoft Research in Redmond, Washington and Cambridge, UK collaborated on this project and the NSDI 2009 paper, "Somniloquy: Augmenting Network Interfaces to Reduce PC Energy Usage." "Large numbers of people keep their PCs in awake mode even though the PCs are relatively idle for long blocks of time because they want to stay connected to an internal network or the Internet or both," said Agarwal. "I realized that most of the tasks that people keep their computers on for—like ensuring remote access and availability for virus scans and backup, maintaining presence on instant messaging (IM) networks, being available for incoming voice-over-IP (VoIP) calls, and file sharing and downloading—can be achieved at much lower power-use levels than regular awake mode," said Agarwal. Following this realization, the team built a small USB-connected hardware and software plug-in system that allows a PC to remain in sleep mode while continuing to maintain network presence and run well-defined application functions. It supports instant messaging applications, VoIP, large background web downloads, peer-to-peer file sharing networks such as BitTorrent, and remote access. The computer scientists say their system is easily extensible to support other applications. The computer scientists named their system Somniloquy, which means "the act or habit of talking in one's sleep." In fact, the system allows a PC to appear to "say" to other hosts on the network, "I'm awake and I can perform non-power-intensive tasks"—even though the PC is in sleep mode. If more computational muscle or resources present on the PC such as stored files are required, Somniloquy wakes up the PC. The goal of Somniloquy is to encourage people to put their PCs in sleep mode more often, for example when they are not being used for computationally demanding tasks. "Reducing energy consumed by wall-powered devices, especially computing equipment, offers a huge opportunity to save money and reduce greenhouse gasses," said Agarwal. 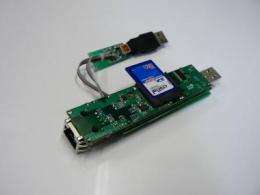 "Somniloquy uses a very small low-power computer. It has a low-power processor, some memory, a lightweight operating system, and a small amount of flash to store data. Everything is scaled down and extremely energy efficient," said Agarwal, a self described "computer systems" researcher who uses hardware insights to build better energy-efficient computer systems. Somniloquy's low-power secondary processor functions at the PC's network interface. It runs an embedded operating system and impersonates the sleeping PC to other hosts on the network. Somniloquy will wake up the PC over the USB bus if necessary. For example, during a movie download, when the flash memory fills up, Somniloquy will wake up the PC and transfer the data. When the transfer is complete, it will go back to sleep mode and Somniloquy will again impersonate the computer on the network. The current prototypes work for desktops and laptops, over wired and wireless networks, and are incrementally deployable on systems with an existing network interface. It does not require any changes to the operating system on the PC, to routers or other network infrastructure, or to remote application servers. The researchers evaluated Somniloquy in various settings and say that it consumes 11 to 24 times less power than a PC in idle state, which could translate to energy savings of 60 to 80 percent depending on their use model. In the future, Somniloquy could be incorporated into the network interface card of new PCs, which would eliminate the need for the prototype's external USB plug-in hardware. Evotek in 1982 invented the technology for disk drives. Come on...the idea that a computer is in sleep mode but still processing bit-torrent downloads or IM chat is ludicrous. The market for this stupidity is purely the ignorant and gullible. WOL has been around a long time, almost since the beginning of Ethernet, but even older is the idea of an IO processor that off-loads IO functionality from the CPU. There is little new here, except the idea of saving energy. Casting an old idea into the context of the PC "sleep" state, in the context of a "Green America" is a good publicity trick, but the technology is not revolutionary. I admit that the SPECIFIC IO functionality to off-load to the low power IO processor takes some work to identify because of the complexity and diversity of the protocols a PC must handle. But then again, the "magic" in the the GREEN revolution is that thousands will be made rich by "reinventing" old ideas and casting them in the glow of "green". It is worth doing, but not necessarily revolutionary. By far most good ideas are variations on previous good ideas - the devil is in the details, and each increment deserves to be evaluated on where it takes the concepts and how well they work. The innovation here is not the concept of having an I/O processor, but the idea of one smart enough to act as a low power multiprotocol caching proxy for its host. For example, handling a large file download to an onboard Flash buffer and periodically waking the main computer to write to disk is not revolutionary - but getting this to actually work and save power is a worthwhile achievement, not to be disparaged (if they do indeed make this work). The described functions are orders of magnitude more complex than WOL (wherein a tiny bit of logic in a controller just waits for a bit pattern from some other computer which has all the smarts - similar to an X10 light switch but on ethernet); the similarities are very superficial. Is this a "reinvention" in green clothing? That seems like a cynical dismissal rather than an evalution. It's the application of existing concepts combined with new development to address a given domain - saving energy while staying online. Calling it a "reinvention" is like calling the first Roomba a reinvention of an old concept, or calling the first gas powered lawnmower ho-hum because gas engines had already been used in cars. Or like calling the original Mac (and Lisa) uninteresting because they were in large part inspired by the work at Xerox PARC on the west coast and the lisp machines from the east coast - but they added their own variations and innovations to that.